As well as the famous 114-116, Charing Cross Road premises, Selmer's also owned the Lew Davis shop near the corner of Denmark Street, and this was purely for retailing guitars. It was a great hang-out for all the session musicians. In the early sixties it was staffed by Geof Livingstone (who had a family band creatively called 'The Livingstones'), myself, and Ray Smith, who was the funniest guy you could ever meet. He had us in stitches doing one-man impressions of whole movies. He was also a great guitarist and prolific music writer - he formed a small music publishing business called Jaymarney Music with a friend called Tony Colton, whose claim to fame was he could chat up women like no one else. He even tried chatting up Princess Margaret at a party on one occassion !! It was a great bludge. Most days we'd be jamming with people like John McClaghlan, Jimmy Page, Big Jim Sullivan, Albert Lee, Eric Clapton, Jeff Beck, Steve Howe. You name them, they were there. 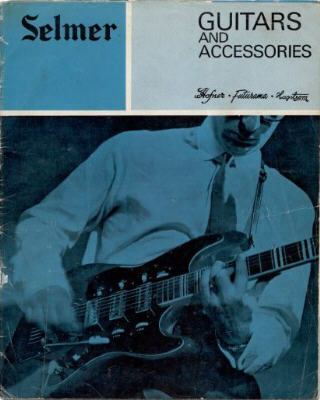 It really was the 'in' shop for guitarists. Jerry Donahue - I believe played with Fairport Convention. John Bell - a brilliant Clarinetist, and I believe he was the top junior clarinetist at the Conservatorium. It surprised the hell out of us when we first heard him play drums. He also used to play squash regularly with myself and Jack Hawkins. Jack Hawkins - An ex-army bandsman and a generally good all round guy. Paul Kossof - He hardly played guitar when he first came to Selmers (only that classical piece that you basically play on the first string of the guitar.) His dad, David Kossof, paid me to give him guitar lessons for nearly a year, but I must admit his style is purely his own (he could finger tremolo just about any guitar in the shop, even if it was a dud.) Sad to see him pass on. Jack Moore - I believe started as a youngster with Selmers, opening and closing the front doors for visitors. I was told he used to wear a uniform with a pill box hat. Certainly worked his way up the ranks! Colin Falconer (myself!) -I used to work for the music publishers Francis, Day And Hunters (just the other side of Tin Pan Alley). In the time I worked there I was regularly called in as the companies session guitarist to record newly written works. I got offered the job at Selmers some years later and snapped it up. They still let me off to do studio work and I also used to play regular gigs around London. (everything from Jazz to Bluegrass). I even did a TV commercial gig with Dave Mowat, the mad Scotsman in the brass department of Selmers, with me playing Banjo (not usually my thing) and Dave singing the lyrics in as good a copy of an American accent as a Scotsman is capable of. (Shudder!). I hope this fills in a few gaps for you guys. I have heaps of memories from this period and could tell you stories all day about the gun fights (true, but not as dramatic as it sounds), online chess tournaments using the internal phone system, a few girls who used to hang around the shop, and some mysterious goings-on in the basement of the Lew Davis shop. Maybe some other time, over a pint? ?